There were a few costumes at my friend Audrey’s Halloween party that were like magnets to my camera. These two kept drawing my eye because every change of expression was magnified by the face paint. Somehow, these particular paint jobs rendered the wearers an incredible goofy sweetness that I couldn’t stop photographing. They are sort of eerily irresistible. For other eerily irresistible costumes and faces, look HERE. This entry was posted in Halloween, Halloween in Mexico, images of faces, Masks, Uncategorized and tagged Daily Post, Daily Prompt, eerie, face painting, Halloween, Halloween image, Halloween in Mexico, Happy Halloween, Images of masks, masks, Painting on October 31, 2016 by lifelessons. Give a bunch of kids a bunch of feathers and just look what they come up with!!! 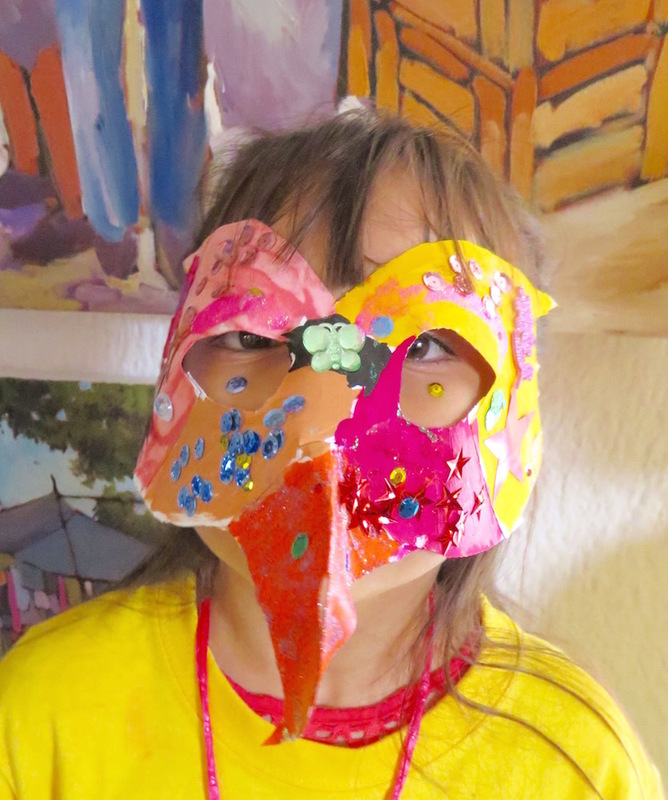 This entry was posted in Art, Arts/Crafts, kids, Masks, Uncategorized and tagged Cee's Fun Photo Challenge, feather art, Images of masks, kids' masks, masks, photos of kids' art on August 26, 2016 by lifelessons. 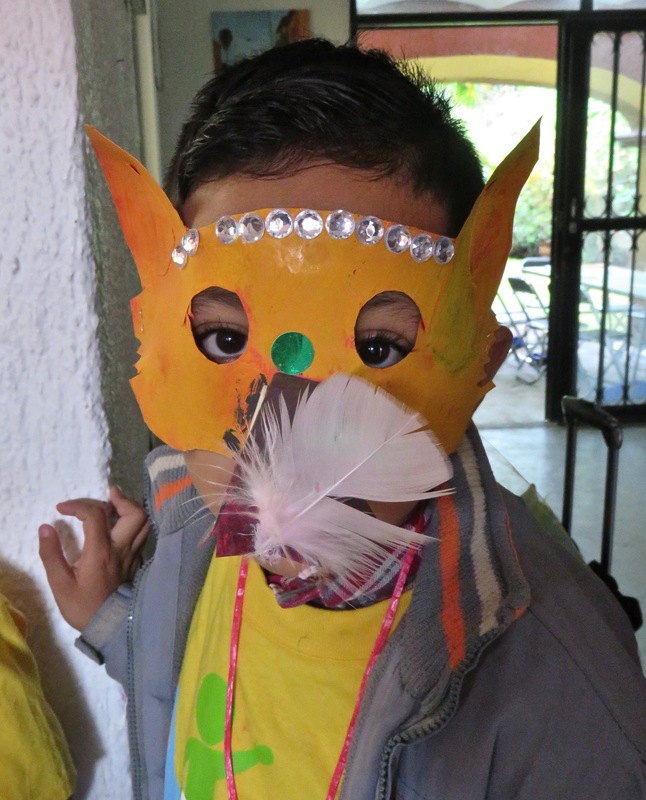 Most of the masks kids made at our week-long camps for kids were stunning and you’ve seen a number of them on past blogs. There were a few, however, that definitely qualify as oddballs! When all else fails, just slap a feather on the end of your nose and call it art! Perhaps it is that one sinister eye peering out or the odd misalignment of the placement of the mask that gives this one an oddball aura. I also like placement of the painting behind which gives him the appearance of having one horn that parallels the drooping ear. Does that look like a goober coming out of his nose and a little green creature reaching up to grab it? 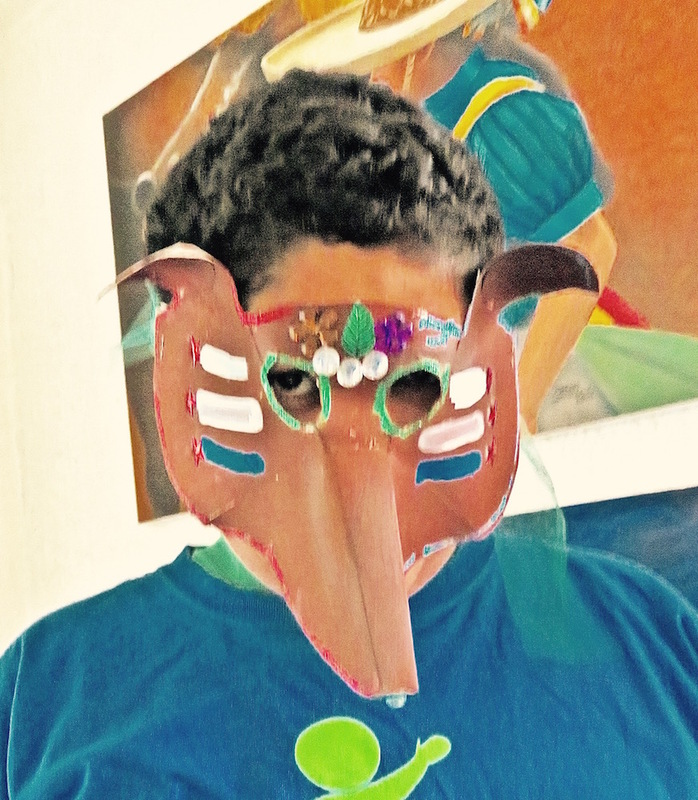 This entry was posted in Cee's oddball Photo Challenge, Masks and tagged Cee's Odd-Ball Photo Challenge, Children, Children's art, Images of masks, images of strange masks, masks, Strange masks on August 9, 2015 by lifelessons. Daily Prompt: Masks Off—We’re less than a week away from Halloween! If you had to design a costume that channeled your true, innermost self, what would that costume look like? Would you dare to wear it? juggling all these masks with just a minimum of strife. A lover, mother, daughter, cousin, sister-in-law, sister. A friend to every woman and a temptress to each mister. A master to my canine friends and slave to all my cats. A pal to all my blogger friends, not just to swell my stats. As well as to some Facebook friends and email friends and Skype. about what others thought of me, I’d dress up like a pig. Why the porcine costume? The tail curled in a ring? Because in my life choices—I want everything! This entry was posted in Costumes, Daily Post, Daily Prompt, Halloween, Masks and tagged Costume, Daily Post, Daily Prompt, Halloween, Judy Dykstra-Brown, Judy Dykstra-Brown Poetry, The Daily Post on October 26, 2014 by lifelessons.